Went to her new home on Sunday 22nd October 2017 . 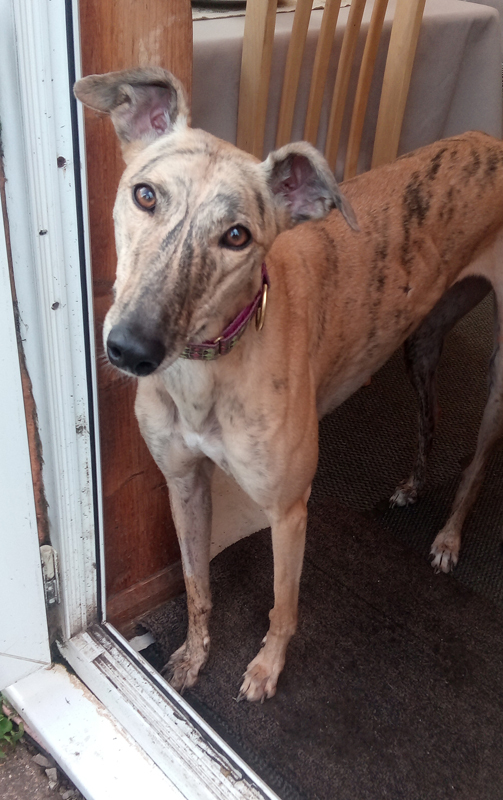 Lilly is a lovely friendly pale brindle ex-racing greyhound who was born on the 8th October 2014. She weighs 27.7kg, is house trained, spayed, inoculated and microchipped. 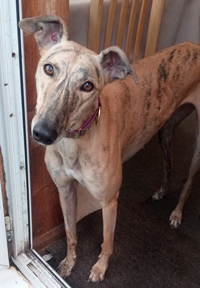 Lilly is fine with children and other breeds of dogs, walks nicely on a lead and travels well in the car. Went to her new home on Sunday 22nd October 2017. This morning Lilly went to the vets to be spayed and weighed in at 27.7 kg. The vet pronounced her fit and well and once she'd been spayed and recovered from the anaesthetic we brought her home and popped her in one of the crates in the living room with a bowl of water and allowed her to rest and recover. Lilly seems fine after her spay and today we sprayed the dressing with water that they put on her tummy to cover the stitches. This helps the sticky part of the dressing to fall away from her skin making it much easier to remove the dressing. Once the dressing was off we checked all was okay with her stitches and their surrounding area. All was good and she will feel much better with that removed.